Samsung is dominating the headlines with the introduction of the Galaxy S7 and Galaxy S7 Edge at MWC 2016. I was really impressed with how Samsung improved upon an already excellent formula, but it's clear to me now that the real smartphone to beat in 2016 is the LG G5. Let me tell you why. Complaints about innovation are as frequent as they are irrational. We grumble that smartphone manufacturers are boring and that new devices lack innovation, and then when manufacturers try something genuinely new – such as the Nextbit Robin – we say it’s pointless. Or stupid. Or won’t work. I have written about why LG is one of the more interesting phone manufacturers before, and it has proven itself again. The LG G5 has an aluminum body with a removable bottom (what LG calls the magic slot) meaning that the G5 looks retains a removable battery, looks and feels great and supports additional functionality. LG has already shown off some of the gadgets that can be attached using this slot, including a bigger battery and a camera grip. These may not be must-have additions just yet, but they do make the LG G5 more versatile than competing smartphones. The LG G5 is not playing it safe, it's breaking new ground. LG hasn’t cut corners to fit the G5 into a certain price bracket. This isn’t a “premium midrange” phone, nor a demo for a unique new feature. The LG G5 is a true flagship, featuring a 5.3-inch QHD display, Snapdragon 820 processor, 4 GB of RAM, MicroSD card support (up to 2 terabytes), a fingerprint scanner, an Always-on display. It's glass and metal, slim and powerful. It has everything a premium flagship should have, does everything a premium flagship should, and more. Unlike most other flagships, the LG G5 doesn’t have just one rear camera but two. Specifically, a 16 MP camera with 78-degree field of view, and an 8 MP camera with 135-degree viewing angle. What this means is that the G5 is capable of providing super-wide photos – perfect for landscape shots – as well as your standard 16:9 shots and selfie portraits using LG's great camera software. LG has really been on form with its cameras since the G Flex 2, one of the first phones to come out in 2015, which still stands as an example of quality smartphone camera tech today. What's more, both the LG G4 and LG V10 sit on our list of the best Android smartphone cameras in the world. 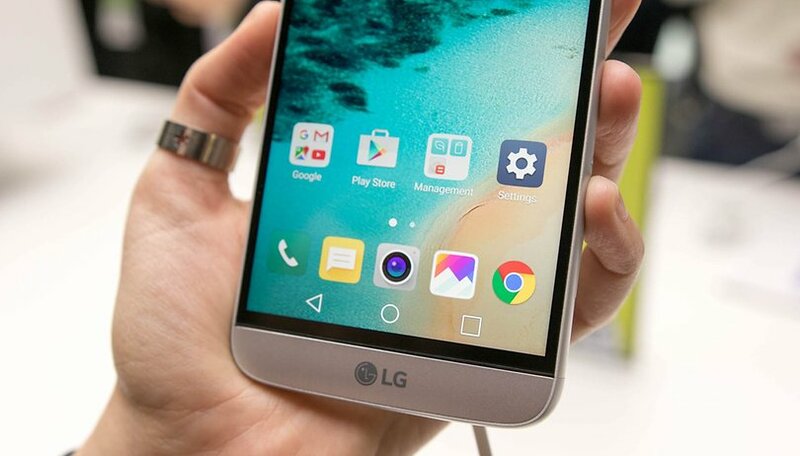 From what we've seen so far, the LG G5 camera will be even better. In the past, I’ve said that LG phones are the "smartphones that do everything”. Of course, they don’t do everything – no phone can. But does any other smartphone achieve as much as the LG G5 does? I don't think so. Let me put it another way: where does the LG G5 get it wrong? I’ll let you leave your response to that in the comments. Why do reviewers concentrate on how "beautifull a phone is (or isn't)? Many people hide it in a case, anyway. I want a phone with the best functionality. I don't care about its color or whether it is expensively clad in gold trim. Because a huge segment of the population buys phones based on their physical appearance. If you don't, good on you, you're a smarter consumer than most. But it's journalistic suicide to review a product and ignore what most people care about. I am happy with the LG line regarding the hardware. What I would strongly recommend is for LG to make software more in tune with the customer. For example if you have to do a Google search to correct an annoying feature (and we all have done that) then they should stand up and take more of it. Sluggish keyboards and Chrome behaving like you are in dial up should not be an issue in a new factory fresh phone. Or having to ditch the Messenger app because of "new message received" spamming during a conversation. Bad software designs can kill the enjoyment of a new product. Imagine buying that top of the line desktop with Windows Millenium on it.......blech.....!!!!!! I don't get it with the s6 battery for some people. My husbands s6 battery will last him all day with medium use. A lot of times it is a app that can drain your battery. That happened to me one time, I Uninstalled it and my battery was back to all day on my note 5. It was a weather and clock app. Buy S7 and L5 and you will be happy. S7 is better, underwater and super camera. Camera and external storage are the NUMBER ONE THING for me! Keep you gimmicks like finger print scanners and hear rate monitors (things I turned off on my S5); I want a good camera! It is so ugly in the back. I loved my original LG "Flex" curve but I had THREE defective phones in four months and had to go through the app reinstall and folder creation. By the time I got through that, I had spent several frustrating hours each time. After the 3rd factory replacement, I had to literally argue with T-Mobil AND LG asking for the newer phone which they both refused. It was not pretty. After I received my 3rd factory replacement, I "Jumped" to my current Samsung Note 5 which I love. I do miss the larger LG screen size (I'm 72) and the curve as that greatly reduced reflection when outside in the sun and it was the best experience late at night in bed viewing a movie, etc. I was treated so badly by LG and T-Mobil that I will never trust either again but I am stuck with T-Mobil for now because I owe them so much money for equipment for two lines and accessories. A year from now I'm out of there and will begin to look around. Who knows, I might even return to Iphone. BOTTOM LINE: LG's customer service was rude and unexpected and it would take something more that a new innovation to lure me back. I have a question. If you buy the L5 and choose to put a case on it; does it require that you pull the case every time you you want to change peripherals? Will case manufactures create a 2 part case for the upper and lower part of the phone? I'm asking because I have not read anything on how that would work. Thanks in advance for any thoughts on this! Yes, you have to remove it. Buy a case that is easy to remove. i have the Obliq and it looks great and is easy to remove. You have always had to remove the case when you changed the battery. Samsung is also thinking about doing away with the app drawer. LG = suspect durability, the phone I am waiting for is the Note 6 to replace my Note 4. My LG G2 survived a lot of abuse and actually wore out the Otterbox cover, a perfectmy flat drop in cement finally shattered the screen so I recently upgraded to the LG G4. I have been happy with the phones. cons: volume rocker on the sides, no app drawer, no LG quick slide or notes, not durable enough to be without a case. Thoughts on the cons: -I'll miss being able to place my phone on either of its sides without have to work about buttons being pressed. -I have too many apps to not have have an app drawer. This should be a toggle option. This is a terrible idea, enough for me to NOT get this phone. -LG software was very useful and attractive for me becoming an LG user, why take something good away? -Unlike the V10 this phone is aluminum and therefore not durable. This is a mistake because of the phones modular nature. One will have to get a case for this phone, however this should make the use of the changeable modules difficult, if not possible. pros: -Outside the box thinking LG is known for i.e. it's modular. -expandable memory -removable battery -IR blaster -fast charging conclusion: This phone is a fail! No app drawer? Seriously?! Ah! That's what I hate about iOS. Samsung had an IR blaster and fast charging solution before LG. My Note 4 is great, but Samsung had it is all to true. I want to see the 2nd version of the V10 and the Note 6. I might have to go back to LG.